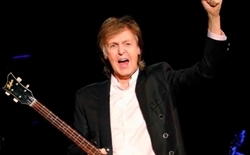 Paul McCartney to visit Australia . Beatles Radio: The Beatles, Solos, Covers, Birthdays, News The Fab 4 and More! Paul McCartney, one of the two remaining Beatles, will appear in Australia for the first time in 24 years. McCartney will kick off his highly-anticipated One On One tour at nib Stadium in Perth on Saturday but on Thursday, at an undisclosed time, 20 of his fans have been invited via social media to take part in a QA at the Regal Theatre in Perth. The time at which they will get to meet their idol won't be revealed until Thursday morning and phones won't be allowed in to the QA. McCartney will also be performing in Melbourne, Brisbane, Sydney and Auckland on the tour but this fan event will be exclusive to Perth. McCartney's last tour of Australia and New Zealand was in 1993 as part of The New World Tour, while a promoted tour in 2002 was cancelled after the Bali bombings.